The Black Lives Matter Movement is alive and well. 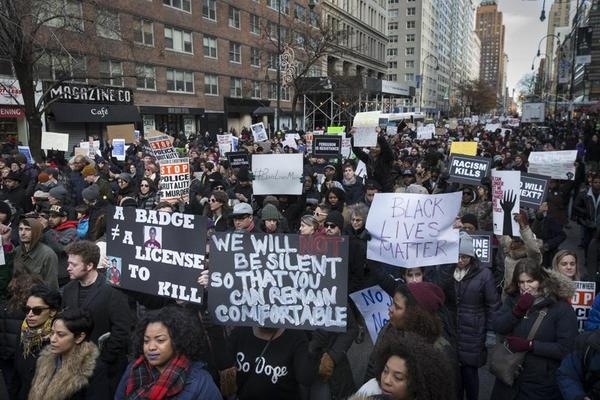 If it has for the moment—under political attack and facing the winter’s sub-freezing temperatures—withdrawn from the streets, it has done so to plan a new stage in the fight for justice for African American victims of police racism and violence. As many as 400 people, mostly young people of color, attended the eight-hour long Black Lives Matter Gathering at the famous Riverside Church in Manhattan on January 30 where in workshops, trainings, and plenary sessions it seemed that a new direction was being set for the movement. Looking around the room and at the stage during the plenary, it was apparent that this event signaled a turn in America’s social movements today. While there were people there of all ages, it was clear that this is a movement of the young, and while there were people of all races, it was also clear that this is a movement led by people of color and by African Americans in particular. Millions March, New York City, December 13, 2014. Black women took the lead in organizing the event, in the workshops, and in the plenary, where the dominant themes were the need for organization, program, and strategy. If they admire the Civil Rights Movement of the 1960s, the activists of today’s Black Lives Matter Movement believe they start at a higher political level, committed to full equality for women and the LGBT community. If some of those involved in Black Lives Matter got their first experience with a mass movement in Occupy Wall Street, they seem have now to have drawn the lesson that a movement needs a democratic organization, a list of demands, and a strategy that can organize the power to achieve them. If they still want no traditional leaders, they are interested in creating an inclusive, democratic, and collective leadership. 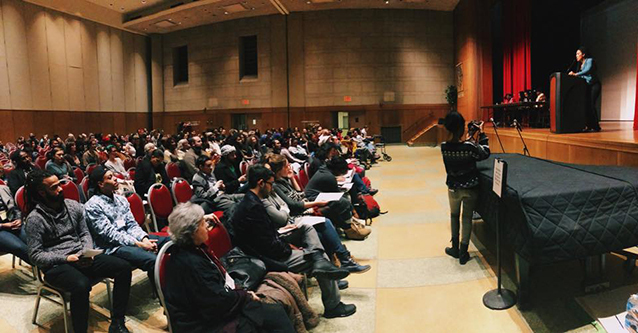 Most of the activists at the Gathering came from community- or campus-based organizations in the New York City area. And while every anarchist, socialist, or communist group seemed to be in attendance—and there are plenty of them—the most striking thing was the sense that the movement was greater than all of the groups, that it had its own independent life. These activists from the Black Lives Matter Movement in New York, made up of tens of thousands who had participated in protests throughout the city over the last several months, had come together at the Gathering to help the movement to find itself, to know itself, and to figure out where it was going. One had the sense of being present at an historic event, one that marks the beginning of new and significant developments. The Black Lives Matter Movement emerged across the country in the fall of 2014 as thousands of people in scores of cities, organized by local groups or national networks, protested the police killings of Michael Brown in Ferguson, Missouri and Eric Garner in New York City. The December 13 Millions March in New York, a march of 50,000 organized by two young African American women, 19-year-old Synead (Cid) Nichols and 23-year-old Umaara Elliot, was a high point in the movement. Still, the change in the political climate caused by the killings of the police officers and the conservative pro-police and anti-movement rhetoric, combined with the arrival of winter and below-freezing temperatures, drove the movement from the streets. Organizers of the Black Lives Matter Gathering felt that this pause provided a moment for reflection, reorganization, and recommitment to the movement’s goals. 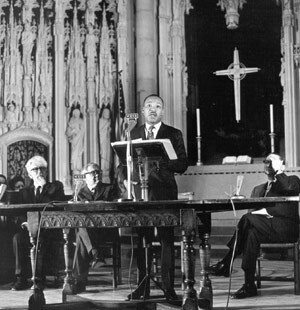 Martin Luther King, Jr. speaks at Riverside Church. The Riverside Church, the site of many important social justice meetings and where Martin Luther King Jr. made his famous August 4, 1967 speech condemning the Vietnam War, provided space for the Gathering’s 2:00 to 10:00 p.m. program of workshops, trainings, networking sessions, and plenary. The program began with six workshops: Independent Media for the Movement; Organizing Youth to Dismantle Oppression; From Ferguson and NYC to Palestine: Occupation, Racism & Militarized Policing; Running in Heels: Safety Strategies for LGBTSTGNC People of Color; Strategy, Tactics, and Movement Building; and From a History of Repression to a Future Liberation: Where do the Police Come from and How can they be Replaced? The Strategy, Tactics, and Movement Building Workshop began with about 40 people in the room but ended up with closer to 100. Akua Gyamerah began the discussion by telling those present, “We will need years of patient organizing. We need action, but also need to pause to analyze the situation. We need to ask how we can build, grow, but also how to sustain the movement.” She suggested that the movement needed to be “democratically structured and prepared to engaged in debates about different strategies” in order to draw the lessons of its experiences. When she also argued that the movement needed to be independent of the Democratic Party, the room erupted in applause. During the discussion speakers—all men and women of color—offered a variety of takes on the state of the movement. One woman talked about the how the Black Lives Matter movement had had a progressive role vis-à-vis the LBGT movement. Another woman was concerned that the various groups in the movement weren’t cooperating. “Right now we are very much fragmented,” she said. One man said, “We need to protest everyday” as well as organizing boycotts. One young woman from a town “up the Hudson,” said she liked the Ferguson idea of being “decentralized but coordinated.” One person argued for organizing around “a few simple demands,” while others thought the movement should be guided by “the needs of society’s most exploited and oppressed.” And there were many other comments and observations. One had to be impressed by the respect speakers showed for each other’s views, though it was also clear that this was only the beginning of what would be a long conversation, and as Gyamerah suggested, there would have to be some serious debate over strategies, goals, and vision. The sense that African American people have played and continue to play an important role and often the leading role in American history was a pervasive notion. Many speakers both in the workshops and in the plenary argued that when black people move, others usually move with them and that that is generally good for the country, that it leads to greater democracy and more power for working people. The plenary session speakers were five black women: the chair, Prof. Johanna Fernández of Baruch College; Danette Chavis, a founder of National Action against Police Brutality; Ansha Rose a 20 year old activist in the Black Youth Project; Thenjiwe McHarrison of Ferguson Action; and Colia Clark, a veteran civil rights activist and Green Party candidate for the U.S. Senate in 2010 and 2012. The four movement leaders—all of them powerful speakers—were asked by Fernandez to respond to the questions at the center of the Gathering: What is this movement? What do we learn from the past? Where do we go from here? What do we need to grow and win? The plenary session at the gathering. Image from event Facebook page. The Black Lives Matter Gathering was a signal event. No doubt it is only one of many such events large and small taking place across the country. The Gathering made clear that we not only have a new movement here, but that there is a new leadership. We are at the beginning of something big and important. Dan La Botz is an editor of New Politics, where this article originally appeared, and a member of Solidarity in New York City. I’ve been a part of numerous activist movements in my 88 years of life, and Black Lives Matter gives me reason to hope that this one may have the staying power to turn this country around.